On one of the rare sunny days during the rainy season, a few Chinese, Korean and Indonesian students are gathered in a classroom in the Asakura Fureai Center, near Kochi University, for an unusual language lesson. But instead of a whiteboard, there are three big tables with gas cookers. Yoko is a Kochi university alumnus currently working in Osaka. That day, she was in Kochi for organizing the event, also communicating with international students. This is not classroom but students are still studying Japanese. 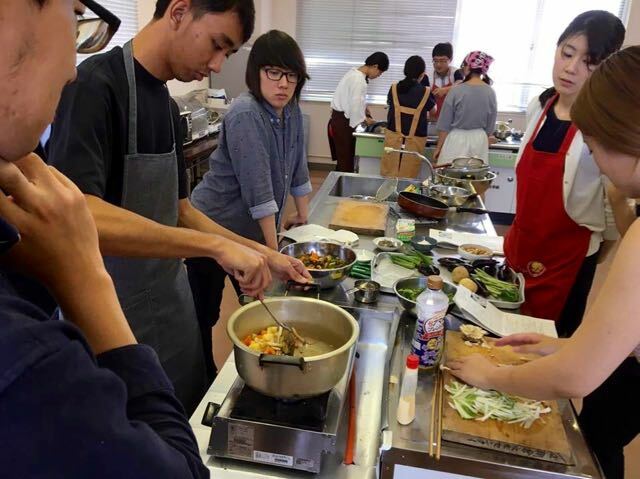 This was the first Vegetarian cooking event named “Vegetarian いろいろ” which was held on 26th of June. This event targeted international students and aimed to broaden their knowledge about Japan, and especially Kochi prefecture. Students were split into three groups and cooked mashed potatoes, creamy milk soup and roasted vegetable soup in a citrus called yuzu sauce. Yuzu is a local variety of citrus that is very popular in Japan. “The biggest reason that we organized this event is because of dietary resrictions” said Otsuka Kaoru, Japanese teacher of the Kochi University. “There are some cultures that restrict eating meats such as pork.” said the teacher. “But vegetables are eaten in most countries. Our target is international students and Kochi is famous for vegetables. So this vegetarian cooking event ‘kills two bird with one stone’ ” teacher said. As of 2015, there are 247 international students studying in Kochi prefecture, of which 146 students are studying at Kochi University. 90% are Asian students. At this event, twelve Chinese, two Indonesian, one Korean, one Mongolian and two Japanese students were participated. Of all prefectures in Japan, Kochi is one of the top agricultural producers. According to the JETRO-Japan, Kochi leads the production of eggplant, small sweet green pepper, ginger and yuzu. Also, farmers are promoting an environmentally friendly agriculture by avoiding the use of chemicals. So, they can produce the healthiest and most delicious vegetables in Japan. Farmers often use plastic greenhouses which allow production to continue throughout the year. “For international students, the most important thing is to meet and communicate with local people and those from other prefectures in Japan.” said the teacher. “There are many Japanese things that cannot taught in the classroom by a teacher, such as spoken languages, verbs and nouns that used in daily activities, cooking etc. So this event could help the students discovering new experience and talking to new people. The meals were taught by Yamanaka Shigeru (38) of the IYEO (International Youth Exchange Organization) of Japan. He was born in Kochi, and since 20 years old he has been one of the rare local vegetarians. Compared to other countries, Japanese cuisine often appears to be mainly vegetables. The phrase ichijyuu-sansai (一汁三菜) one soup three side refers to the general type of traditional Japanese meal served. Three dishes often include, bowl of rice and main dish called okazu (おかず) that is typically fish, meat, vegetable or tofu and side dish called tsukemono (つけもの), preserved vegetables that usually pickled in salt. Nowadays people often eat more vegetables in their daily diets. Japanese ichijyuu-sansai is one of the best examples of a well-balanced diet in the world. For international students, Japanese is learned not only in a class, but also by talking to people. Through to participating in the events, students can meet various people. Making a conversation with Japanese people is easy enough, but it takes months or even years for becoming “friends”. This is related to the traditional Japanese social custom of uchi (うち) means inside, soto (そと) means outside. Becoming one of the uchi members takes a very long time and needs high Japanese skills. Also it is difficult to deeply understand about Japanese society without making friends. Yes, actually, international students must learn The typical Japanese life styles. Only academic knowledge is not enough to know about Japan. Everyone can learn about Japan everywhere but real experience is very important. This is also an interesting story for Japanese. I was born and raised in Kochi and I’m so happy that people are trying to teach about Kochi to foreigners. This is the good way to show and introduce Kochi to international students! I want to join it next time even I’m Japanese! It is very useful to learn language in this interesting way. And after staring at these pics I feel so hungry now! It’s a good event for international students to feel Japan. But I think it is also good for Japanese students because like this article said, we have less opportunity to eat vegetable, even if there are a lot of delicious and fresh vegetables in Kochi. Actually, I also joined this event to help cooking as japanese student. It was interesting event for me, and I could learn the importance of acceptting mimority like vegetarian. I hope these events will be held once again. I didn’t know that Japanese ichijyuu-sansai is one of the best examples of a well-balanced diet in the world. Vegetables made in Kochi is very good. I want many people to eat various vagetables of Kochi. Also I think communicate with foreign people through cooking is nice. This uchi-soto culture learning through vegetables is interesting. I also think it is natural to tell asian students in our university first because they have been already used to those.